Why Do They Bite the Bullet? It’s a good question but no one seems to have the answer. It all started on the night of August 4th 2009 when I dreamt the fly! Sad as this may seem it turned out to be quite an auspicious moment. 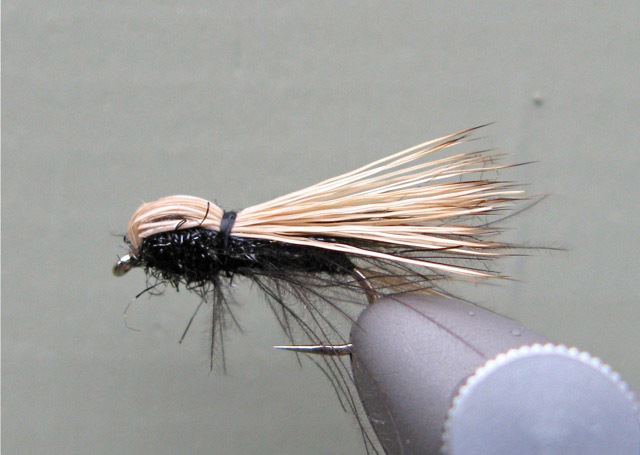 The evening before I’d been tying a few ‘Comparaduns’ …well actually they’re ‘Compara-Ducks’ because I tie the bodies with CDC instead of ordinary dubbing. 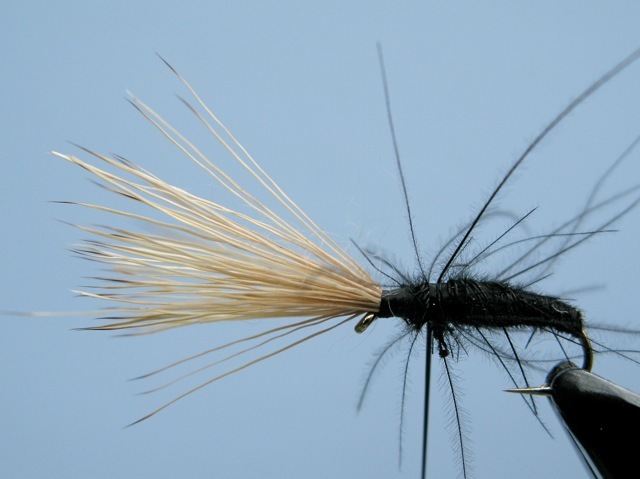 They are always part of my dry fly stock and have caught me some good fish, especially in fast water.Anyway…in this dream I considered keeping the CDC body but, instead of making a Comparadun fan shaped wing, I would tie the Deer hair down, up to the eye of the hook so the tips are projecting forward over the eye approximately the same length as the hook. Then make the body of CDC, then tie in a thorax of black Ice Dub, pull the hair over and tie it down behind the thorax to form a bullet shaped head. I woke at about 2.30am thinking ‘That’s a good idea…bet I don’t remember it in the morning.’ But I did and at about 6am I tied my first ‘Bullet’. I searched all my books and spent time on the Internet trying to identify the pattern. I even emailed several experienced tiers and asked them if they had seen it before. The most constructive answer came from my esteemed editor Mark Bowler. 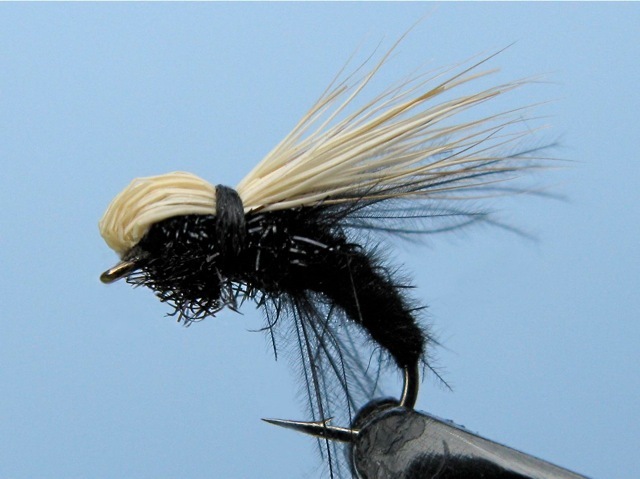 He said that the pattern fell somewhere between Hans Weilenmann’s ‘CDC and Elk’ and Roman Moser’s ‘Balloon Caddis’. I was delighted that my inspiration appeared to come from such distinguished sources! The 5th of August was one of my syndicate days on the River Test and I’d invited my good friend Chris Patrick to join me. 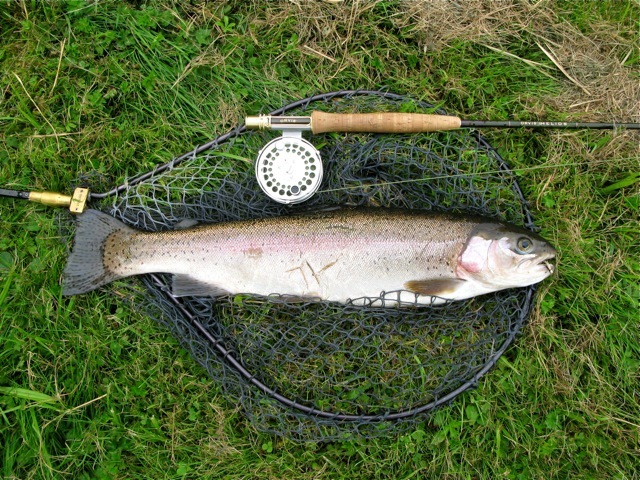 Chris has been fly-fishing for over 30 years and the only way to stop him catching more than you is to hide his rod! He caught the biggest Permit on the fly at the Palometa Club, Mexico in the 2007 season and is a regular rod on a beautiful stretch of the River Itchen where the Trout regularly throw themselves onto his flies with monotonous regularity. We had a good morning on the river and just before lunch decided to have a passing cast on one of the two small lakes which nestle in the woodland nearby. They were full of weed and the trout had, what can only be described as, a rather jaundiced attitude towards anything attached to a fly line. After an hour of presenting almost everything in the box I tried the ‘Bullet’, cast to the middle of the lake and started a slow retrieve. A couple of casts later Chris suggested I just ‘leave it out there’. Not really concentrating I watched it wafting about in the breeze. When it came the take was spectacular! The fish came out of the water like Polaris and provided all the usual clichés from ‘hooped rod’ to ‘heart stopping runs’. It weighed 5lb 3oz and kept a well-earned appointment at the local smokers later that afternoon. ‘The Bullet’ caught fish after fish for the rest of the day and I had to promise Chris that I would tie up a whole bunch of them for our next trip. A few days later on different stretch of the Test we fished ‘The Bullet’ exclusively and caught 17 fish between us. I asked Chris to try it on the Itchen. 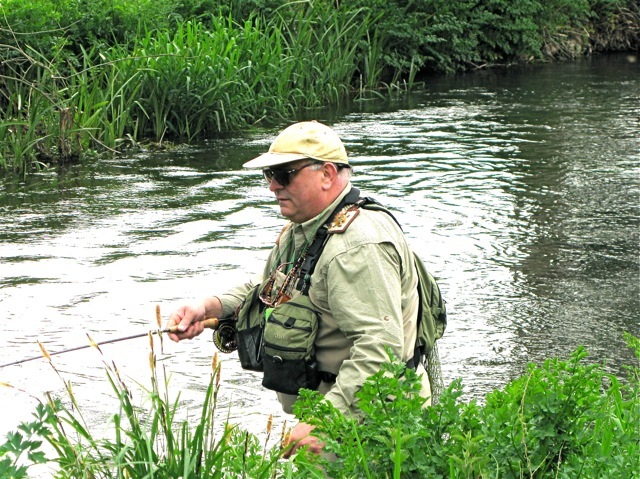 He reported that fish came to the ‘Bullet’ all day including many specimen grayling. Flushed with success I visited my local syndicate lake that I don’t usually fish during the summer months. At least half of it was weed bound but ‘The Bullet’ caught 8 Rainbows in three hours! 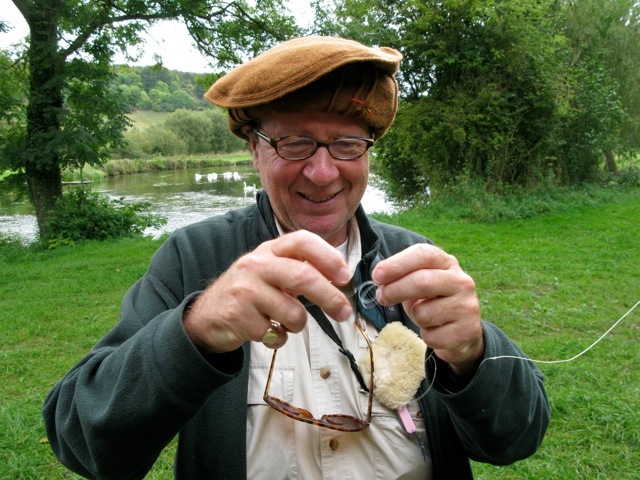 My second ‘Bullet’ tester was my chum John McGill who has a PhD in Fresh Water Biology. 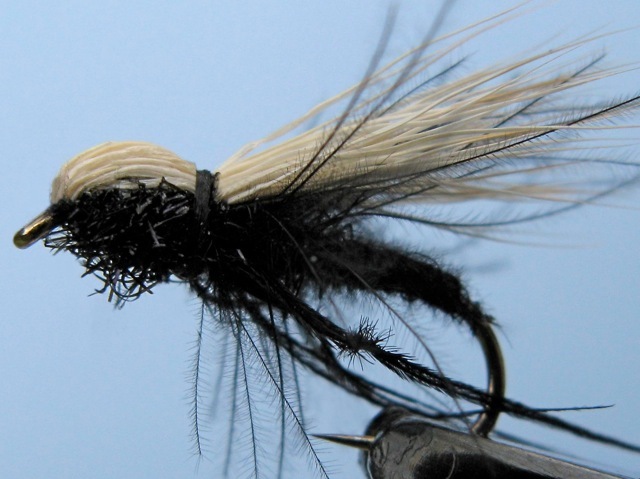 I invited him for a day on the river and asked him what he thought ‘The Bullet’ represented to the trout. He looked it over with and without his glasses, examined it’s underside, squeezed it, smelt it and passed it back to me. He then gave me the full benefit of 7 years university education. ‘Food’ he said. We both fished it that day for a total of 10 fish including John’s personal best Brown Trout that weighted in at exactly 6lbs. When he’s not writing some award winning advertising campaign I’m fortunate enough to occasionally fish with Neil Patterson so I invited him to help put ‘The Bullet’ through its paces. The day did not start well. While Neil was making a cup of coffee he left his rod propped up against the hut and I thought I would examine his tippet in the hope that I might steal a few secrets. At first glance one is convinced that this arrangement of different strength nylon, definitely falls into the ‘buggers muddle’ category. I gave one section a pull to test the knot and it broke! While Neil retied it he explained the technical merits of this strange assembly of nylon. I won’t give any secrets away but suffice it to say it presented ‘The Bullet’ beautifully, quite often at great distances that I had never been able to reach. I forget how many trout we caught but Neil seemed impressed with the fly. If fact a few days later I got an email from him asking me to tie him a few more ‘Bullets’ as he’d put his ‘up a tree’! I know all three ‘Bullet’ testers well. I also know that they’ll do anything for a half of bitter and a cheese and pickle sandwich. With this in mind, I asked them for their reaction to the success of this fly. 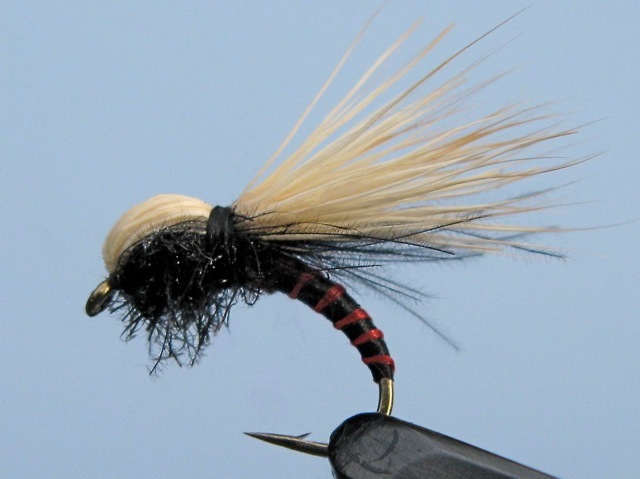 “The Bullet” is indeed a fabulous fly but perhaps raises more questions than answers. Should it be fished with a shooting head? Is a gun license necessary? Will fish continue to bite the bullet? Have fun finding out…………. I am always interested to see the reaction of the fish to different fly patterns. 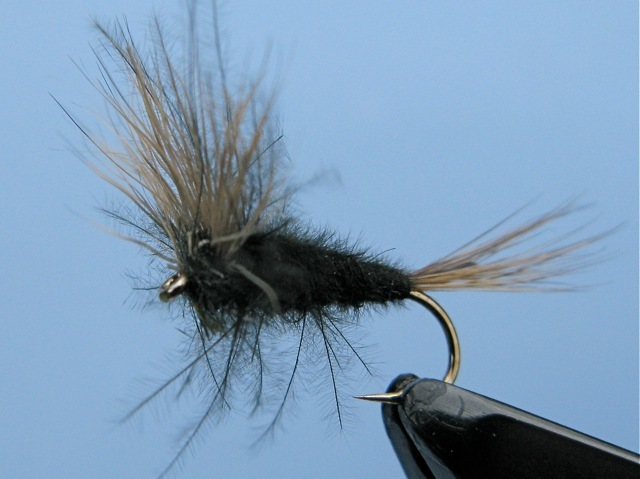 In my experience, there are a very few patterns which trout will take without the slightest hint of suspicion. Chris’ new pattern adds to that short list. Personally, I am intrigued as to what the fish were (mis)taking this pattern for? Could it be sedge, a hatching ‘something’ or even a wind-blown terrestrial? But then I think ‘who cares’? It works! All I can say is …Tie it and try it. You won’t be disappointed! “So effective, it takes the fun out of fishing.” I can only hope he managed to have ‘fun’ with the ones I sent him! Trying to calculate how many fish have bitten the ‘Bullet’ has not been easy but with Chris Patrick’s help we calculate that between 4th August and the 23rd September 2009 it hooked and landed in excess of 100 Trout and Grayling. Here’s how to tie it along with a few of the variations that I’ve come up with since that dreamy night last August. Hook. Fulling Mill. ‘All purpose’ light. Sizes 12-16. Head/wing. Bleached Elk. Thorax. Black Ice Dub. Apply about 3mm of black thread to the hook. Cut, clean and stack a good pinch of bleached Elk hair. Now ‘pinch and loop’ the hair on top of the hook with the tips facing forward. The tips should protrude beyond the eye slightly more than the length of the hook. Before tying the waste ends down, trim them at an angle to achieve a nice tapered body. Tie in a black CDC feather by the tip at the back end of the hook. You can make a neat job of this by putting two loose wraps over the stalk end of the feather, pull it through away from the hook and tighten the thread at the tip. Move the thread back up the hook to about 3mm behind the eye. Wind the CDC feather forward to form a smooth body. As you approach the thread, hold the loose CDC fibres back, as you wind forward and tie off where the thread is hanging. Wind the thread forward to just behind the eye and then dub with a pinch of black Ice Dub. Wind the Ice Dub back until it meats the CDC securing it with a couple of tight wraps. Leaving the silk hanging in this position pull the Elk hair back over the body and tie it down behind the Ice Dub forming a neat head and thorax. 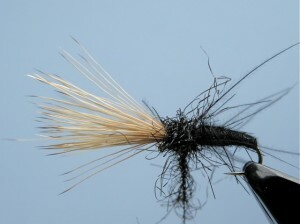 Whip finish with the thread in this position and add Bug-Bond or varnish to the head of the fly and the wraps for durability. 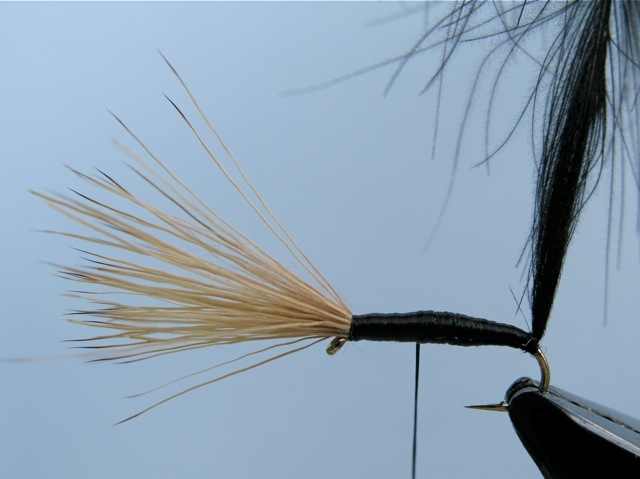 Once you’ve tied a few ‘Bullets’ I’m sure you’ll want to try some alternative materials and hook sizes. Here are three of mine that have proved successful. The B100 Bullet is tied as per the original instructions but on a Kamasan B100. (Obviously!) I usually tie them in sizes 14 and 16, but for ‘Baby Bullets’ 18’s and 20’s seem to work well. The ‘Buzzer’ Bullet is based on my favourite buzzer that I tie once again on a KamasanB 100 with a body of black and red silk. You’ll notice there is still an element of CDC in the fly. 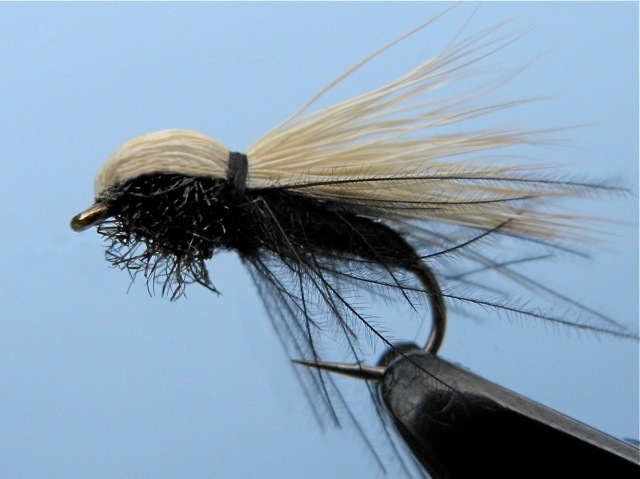 This can be tied in as an under wing or spun in, mixed with the Black Ice Dub for the thorax. The ‘Leggy’ Bullet is tied in the original way but add two black (one knot) pheasant tail legs either side of the body before you dub the thorax. Only apply floatant to the Elk hair. The CDC will dry with a quick squeeze and a couple of false casts. The fly performs best with a fairly slack line. I bet the first take makes you jump! Enjoy!